This is the sort of thing that's very easy to do, but a bit tricky to do very well. Gnocchi need a light touch and as little flour as possible to make them light and delicious. I can honestly say that I'm as happy with this dish as I have been with anything I've cooked. I love the arrival of slightly colder weather, as it gives me an excuse to go back to cooking this sort of food. If someone asked me what me favourite dish is, I'd probably have to reply "a cheap cut of meat cooked for several hours". 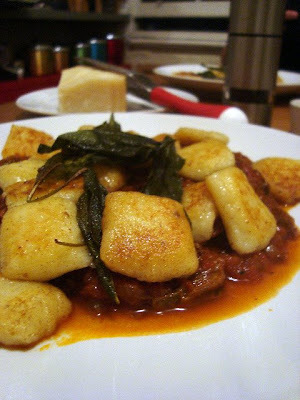 This dish was inspired by Cantina's delicious pan-fried gnocchi. I can't remember what they served them with, but it was incredible. Softly sweat a large onion, a couple of cloves of garlic, and maybe some celery. Meanwhile brown the oxtail pieces on all sides over a high heat. Add some crushed spices (fennel seeds in this case), a cinnamon stick, bay leaf, a few tins of tomatoes and some wine to the onions, then add the browned meat and braise at 150c for four or five hours. Take the tail pieces out of the braising liquid, allow to cool, carefully shred with forks, return to the braising liquid. Take 6 medium-sized potatoes, prick their skins all over with a fork, rub them with olive oil and place on a bed of rock salt. Roast at 220c for about an hour. Give them a couple of minutes to cool down, then slice them in half and scoop out their insides. Push the potato insides through a sieve (a masher is not fine enough), then season, add an egg yolk and half a handful of flour. The idea is to shape this potato mix into sausage-like strips and then cut them into gnocchi (which apparently means "lumps"). The problem with this is that your mixture will be quite wet and sticky, and hard to work with. You need to add flour to make it more pliable, but not too much flour. Flour makes your gnocchi heavier and stodgier, so you need just enough flour to bind it all together without overdoing it. The whole thing is a bit hard to quantify, and it has taken me a few attempts to really be happy with the results, but these particular gnocchi were everything I'd hoped for: soft, light little things that still held together in the pot. To cook them I blanched them in a large pot of salted water and then placed them in an enamelled cast iron pan with plenty of butter. Don't be tempted to turn the gnocchi too often, as they won't get that beautiful browned outside if you do. Add a good handful of sage leaves for the last 45 seconds or so, and serve on top of braised oxtail. Serve with good parmesan. I would once again like to express my regret at missing this. haha, its funny because you were offered it MANY TIMES THAT DAY. Fail. I am scared of making potato gnocchi. IT NEVER WORKS. It's always too gluey or soggy or something. SO I MAKE RICOTTA ONES! They're pretty good! yeah I make ricotta 'gnudi' using the river cafe recipe. Pretty good! I wasn't happy with the first few lots of gnocchi I made, but I think it's the sort of thing that you just have to get a feel for. Basically the key seems to be keeping it as wet as possible and only adding as much flour as is absolutely necessary. Whenever I add enough flour to make it comfortable to work the dough it gets a bit gluey. Prosciutto and Fig and Chevre, oh my!